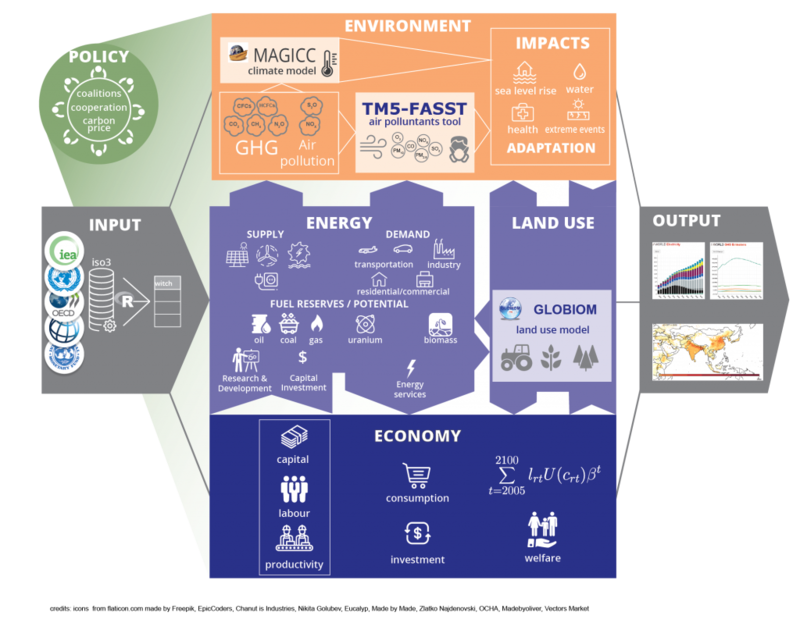 WITCH (World Induced Technical Change Hybrid) is an integrated assessment model designed to assess climate change mitigation and adaptation policies. WITCH consists of a dynamic global model that integrates in a unified framework the most important elements of climate change. The economy is modelled through an inter-temporal optimal growth model which captures the long term economic growth dynamics. A compact representation of the energy sector is fully integrated (hard linked) with the rest of the economy so that energy investments and resources are chosen optimally, together with the other macroeconomic variables. Land use mitigation options are available through a soft link with a land use and forestry model (GLOBIOM). A climate model (MAGICC) is used to compute the future climate. Climate change impacts the economic output through a damage function, depending also on the rate of investments in adaptation. This allows accounting for the complete dynamic of climate change mitigation and adaptation. WITCH represents the world in a set of representative native regions (or coalitions of regions); for each it generates optimal mitigation and adaptation strategies for the long term (from 2005 to 2100) as a response to either climate damage or some external constrain on emissions, concentrations or temperature. These strategies consist of investment profiles resulting from a maximization process in which the welfare of each region (or coalition of regions) is chosen strategically and simultaneously accordingly to other regions. This makes it possible to capture regional free-riding behaviours and strategic interaction induced by the presence of global externalities. The non-cooperative, simultaneous, open membership game with full information, is implemented through an iterative algorithm which yields the open-loop Nash equilibrium. In this game-theoretic set-up, regional strategic actions interrelate through GHG emissions, dependence on exhaustible natural resources, trade of oil and carbon permits, and technological R&D spillovers. The endogenous representation of R&D diffusion and innovation processes constitute a distinguishing feature of WITCH, allowing to describe how R&D investments in energy efficiency and carbon free technologies integrate the currently available mitigation options. The model features multiple externalities, both on the climate and the innovation side. The technology externalities are modelled via international spillovers of knowledge and experience across countries and time. In each country, the productivity of low carbon mitigation technologies and of energy depend on the region stock of energy R&D and by the global cumulative installed capacity, two proxies for knowledge and experience respectively. The R&D stock depends on domestic investments, domestic knowledge stock, and foreign knowledge stock through international spillovers. The spillover term depends on the interaction between the countries’ absorptive capacity, and the distance of each region from the technology frontier. This formulation of technical change affects both decarbonization as well as energy savings. 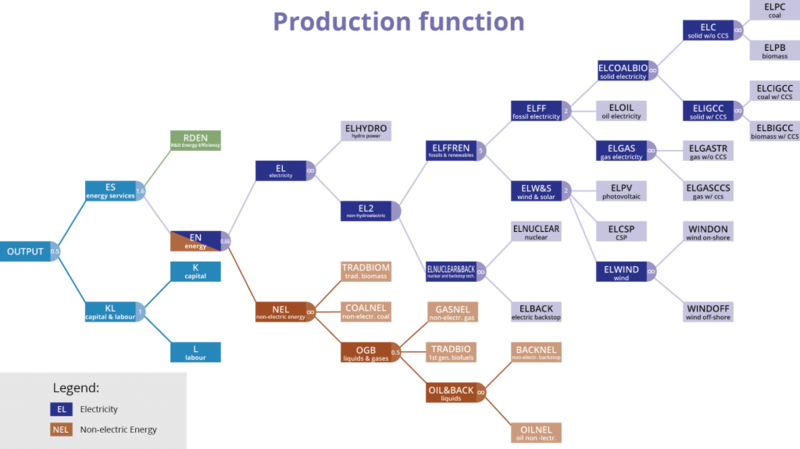 WITCH is maintained and developed at the RFF-CMCC European Institute on Economics and the Environment (EIEE). It was originally co-developed by Fondazione Eni Enrico Mattei (FEEM) and the Centro Euro-Mediterraneo sui Cambiamenti Climatici (CMCC).